As of august 2016, Vietnam welcomed 5.5 million foreign tourists, an increase of 24% compared to the same period last year. about 38.2 million domestic visitors were served. total turnover from tourists during the period reached 235 trillion dong, up 22.9% compared to the same period last year. According to official statistics, in 2015 the Vietnamese tourism sector contributed 6.6% to the country's gdp. in terms of its contribution, Vietnam's tourism ranked 40th worldwide, which provided 750,000 direct jobs out of 2.25 million tourism-related jobs. to date, Vietnam has 1,555 international travel companies, 101 five-star hotels, 229 four-star hotels, and 463 three-star hotels. 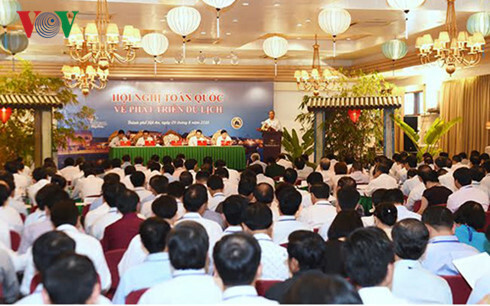 The Vietnam National Conference on Tourism Development, held on August 9th in the ancient town of Hoi An in Quang Nam Province, was considered a new and significant impetus to help Vietnam’s tourism sector handle its difficulties and obstacles for further development, towards the goal of making tourism become a spearhead sector of the economy by 2020. The event was chaired by Vietnamese Prime Minister Nguyen Xuan Phuc, and Deputy Prime Ministers Vuong Dinh Hue and Vu Duc Dam. The conference was attended by leaders of ministries, branches and localities where there are key tourism sites, as well as big travel agencies nationwide. The delegates agreed with the suggestion to expand the number of countries and territories to which Vietnam applies a visa exemption for tourists, for the objective of "three decreases"; shorter time, lower fee and quicker procedures. To date, Vietnam has applied the visa exemption to 22 countries and territories, compared to the number of nearly 160 by other nations in the region. This is one of the reasons why international tourists want to visit other countries in Southeast Asia instead of coming to Vietnam. Delegates of localities also recommended that the government issue solutions that would allow some night tourist activities. Addressing the conference, Prime Minister Nguyen Xuan Phuc said that many localities in Vietnam can develop tourism on different levels, however they should define the right orientations for its investment and development. "There are no red-light streets in Vietnam or casinos. But the Government will implement policies that favour tourism development" said the Prime Minister, adding that the Government has allocated 200 billion dong to the Ministry of Public Security to set up and develop an electronic visa processing system, which will be put into operation from January 1,2017. Prime Minister Nguyen Xuan Phuc also agreed with delegates at the conference, saying that Vietnam's tourism development has not yet matched up with the country's potential and advantages. "Vietnam is determined to fulfill its goal of making tourism an important part of the economy," the Prime Minister confirmed. The government leader said that there must be a strong determination and participation of the entire political system, a close and synchronous co-ordination, a high spirit of working and responsibility of the ministries, branches and localities, in implementing that goal. Investors, businesses, communities and people nationwide are required to bring into full play their dynamism and creation in developing tourism. The Prime Minister said that tourism development must be quality and professionally directed, with concentration and key sites, brands and competitiveness defined, which are closely linked with preservation and development of national cultural values, environmental protection, and a guarantee for national defence and security, and social order and safety. The Prime Minister agreed to the establishment of the Tourism Development Support Fund, which is mainly used in promoting tourism, investing and developing tourism products, training and developing tourism human resources, and enhancing the sector's institutional capability. He also ordered a close check for the quality of tourism services, especially accommodations and services at tourist sites; a guarantee of good hygiene, order and nice behavior at the airports; improvement of processing procedures and providing favourable conditions to tourists to pass quickly and conveniently procedures the airports as well as road-and waterway destinations. The Prime Minister entrusted the Ministry of Culture, Sports and Tourism to implement the code of conduct in the tourist field and handle the shortage of tour guides, especially those qualified in foreign languages.